At the invitation of the Ministry of Culture, Information & Broadcasting, Government of India, Mr. Wang Guoqing, Vice Minister of the Information Office of the State Council of China, at the head of a delegation, visited India from November 24 to 30. 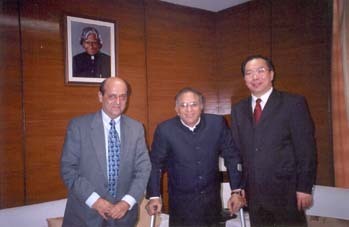 During the visit, Minister Jaipal Reddy and Secretary N.B. Chawla of the Ministry of Culture, Information & Broadcasting met the delegation respectively. The two sides held talks on the issues of strengthening exchanges in the fields of foreign publicity and media administration. They also held discussions on increasing the exchanges of visits by the information officials from concerned authorities of the two governments and boosting the interactions and mutual reporting between media persons of the two countries. Both sides expressed that as countries of ancient civilizations with long histories, China and India shared many similarities. The two countries should take advantage of modern media to strengthen mutual understandings and increase reports for the sake of expanding contacts, learning from each other and improving friendship. During the visit, Mr. Wang also exchanged views with ministers in charge of information affairs in the states of Maharashtra and West Bengal on press release and foreign publicity of the two countries. The delegation also made a study of Indian media including the Doordashan, PTI, Times of India, Jain TV. During the visit to Kolkata, the delegation met the representatives of the Chinese societies and briefed them on the economic achievements in China.